The 'Features' section is our creative and catchy name for all the other articles on our site, which would otherwise become lost within it. It looks at the way service areas work and puts some of them under the microscope. The truth behind the oldest service station in the UK, and quite a few myths debunked. Written to commemorate the 50th anniversary of Watford Gap, this page takes a look at how services have changed in the past 50 years. Five services plucked and placed under the microscope, with special attention paid to their architectural interest. A general guide to how parking works at services, answering some of the most common questions. A look at the other side of the coin as to why services are so expensive, and a few tips to get the better of them. Information written specifically for coaches and HGV drivers, listing some of the offers available to them. An explanation of how services are regulated and how the policy on them has changed over the years. A non-technical guide to the different road signs used and who is responsible for them. 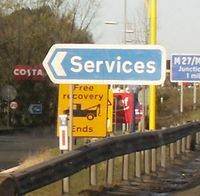 A collection of pages which explain the meaning of various technical and unofficial terms relating to motorway services. Across the site we ask you to rate different service stations, and here you can see how they all stack up alongside each other. It's very rare that a large service station will completely shut down, but we've listed them all as well as some of the more interesting smaller ones. A list of the working titles given to the original service stations. Spot the gaps in the pattern! A look at the different discount and information apps offered to help and persuade motorway users. Many modern A-road services have adopted a building which pre-dates the road network as we would recognise it. This page lists them. Motorway services originally sold promotional postcards - find the best of them here. A list of services which have played a significant role in a TV show (previously this information was spread out over all the trivia sections). A list of services which have been reported to have caught fire. A look at services which are now drastically different to how they used to be. An automatically-generated list of services which have changed names. A list of all the services with a 'secret exit', as well as information on what these things are and who can use them. It started as a list of roads with few services, but this page now takes a deeper look at the problem and what is being done about it. In a new feature, we highlight a couple of the motorway network's oldest service stations, and offer a detailed analysis of how they came to be. The area surrounding South Mimms services has a lot more history than you'd think. A detailed look at one particular site which never quite made it as a service area. For a while it looked like the LFE would close within a few years, so this feature was produced. It led to a bit of an anti-climax.